Varicose Veins Can Make You Want to Avoid Wearing Shorts or Skirts. But, With Varicose Vein Treatments Offered by Tariq Mirza, MD of Ariba Medical Spa in Fremont, California, You Won’t Have to Hide Your Legs Any Longer. Contact Us for More Information, We are Conveniently Located Near You at 37553 Fremont Blvd, Fremont, CA 94536. Varicose veins can make you want to avoid wearing shorts or skirts. But, with varicose vein treatments offered by Tariq Mirza, MD of Ariba Medical Spa in Fremont, California, you won’t have to hide your legs any longer. Dr. Mirza and his team can resolve varicose vein issues and even out your skin tone, all in a single treatment. Find out how varicose vein treatments can benefit you by scheduling an evaluation online, or over the phone. You’re also more likely to develop varicose veins if you’re female, especially during pregnancy. Spider veins are similar to varicose veins, but they’re smaller, closer to the surface, and tend to spread out, like cobwebs. Treatment is usually the same for spider veins. Treating varicose veins — or spider veins — depends on the severity of your symptoms. Dr. Mirza spends time evaluating your skin and goes over your health history to help plan the best solution for your specific needs. You may benefit from a series of skin laser treatments to minimize the appearance of varicose veins. Dr. Mirza may also suggest having a sclerotherapy treatment. This highly-effective procedure — performed right in the office — involves injecting your varicose veins with a specialized solution. This solution safely scars the veins and forces them to close. Over the following weeks, your varicose veins start to fade. Because varicose vein treatments are convenient, effective, and safe, you can have your treatment repeated if you notice new varicose veins. Sometimes varicose veins can be prevented, although many men and women are just more prone to developing this condition. Once Dr. Mirza treats your varicose veins, or spider veins, he can help you work towards prevention. If varicose veins or spider veins start to resurface, make an appointment with Dr. Mirza right away. The sooner you start treatment, the easier it is for you to have smoother, more even-toned skin again. 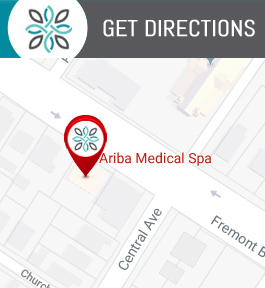 Schedule your varicose vein evaluation at Ariba Medical Spa by using the online scheduling feature or by calling the clinic.